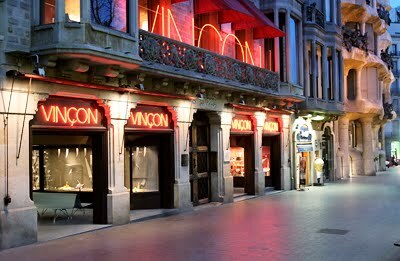 Vinçon is a very hip department store in the heart of Barcelona. It's a designers heaven and had I had a truck handy and wasn't flying then I would have gone crazy. They've a really nice selection of housewares as well and toys for kids and adults alike. These are some (bad) photos of their old wrapping paper, their identity and packaging has a long history of high design. So much to they value their style that there's even a section dedicated to it on their website. Below are a few of my faves. The store is in a really grand old building, with a superb terrace out back. I really love this tire horse. But I'm not sure it would really swing well, like a tire swing should. And it weighed a tonne. But it's pretty rad. Vinçon: 96 Passeig de Gràcia. Open: 10:00 to 20:30 hours, (without interruptions!). That looks like a lot of fun for a department store. I'll have to check it out next time I'm in Barcelona. Thanks for the idea.